So my dear seven-year old is schlepping home his school supplies since they’re almost out for summer vacation, and his crayons were in a particularly sorry state. No fear! 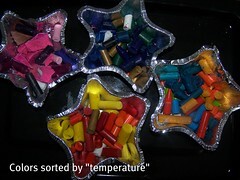 We can recycle them into fun rainbow crayons, and keep the kiddos occupied for a while, too. Sort the crayons by color categories- cools, pinks, brights, whatever. Put your aluminum baking cups on a cookie sheet, and pop it into a 275 oven for, oh, 15 minutes or so. You’ll see when it’s melted through. You can either turn off the oven and wait for it to cool in there, or take them out and let them cool on the counter. I was impatient, so after they were cool enough to handle, I stuck them in the fridge for 15 minutes. When cool, peel off the aluminum. Voila! 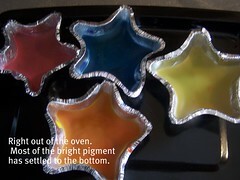 Fun rainbow crayons!! Now you just have to open up some old paper shopping bags and let ’em get creative! Fantastic! When I got married this summer I had LOTS of children in the wedding party and at the wedding. 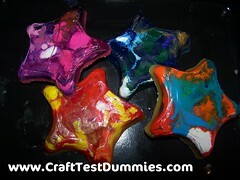 I wanted everyone to feel involved so we made 2 star crayons for each child with a small pad of paper. It was such a hit. Thanks! They also make heart shaped ones, and you can get ghosts and pumpkins around Halloween. I found this blog when I was searching for crafty stuff – it’s way fun! (love the name) I’ll be bookmarking it to read more later. This is neat but you do have to have a lot of patience peeling off all of the wrappers. 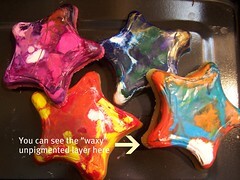 So if you plan on doing this with little ones I would peel the crayons ahead of time. I had a total of 4 that were easy to peel off. I was planning on making a lot of these and I only made about 4. I used a vegetable peeler to get the waxy part off of the outside.